" AUDIO - Brad's Guest Hosting Radio Mayhem	"
I was scheduled to Guest Host the Peter B. Collins Show last Thursday and Friday. We came to Phoenix to do it with the assistance of 1480 KPHX, Phoenix's Air America affiliate and Nova M Radio Network flagship station. Thursday went well enough with three hours of the PBC show as smartly broadcast from the studio. Friday, however, was another story. Despite (hasty if) best-laid plans to hold a live AZ Election Integrity townhall forum Bradcast from the Plumbers & Pipefitters Union Hall here in Phoenix, we were unable to establish contact from the remote location up to PBC's network hub in San Rafael. While a big house of eager folks waited patiently in the hall throughout the technical snafus, and as "Best of PBC" shows played in the meantime, we received a call from Mike Malloy that he was not feeling well and would be unable to do his show on Friday night which airs right after PBC's on KPHX/NovaM and on Sirius Radio, etc. He asked if we could fill in for him and the answer, making lemonade outta lemons was; "Sure! If we can get back to the studio in time!" After which we invited everyone in the hall who wished to join us back to hang with us at the studio as we then hightailed it back and did the final hour of PBC live over there instead followed by three hours filling in for Malloy. And so it was. We picked up a bit of our planned AZ Election Integrity forum for the last hour of PBC and the first hour or so of Malloy as many folks hung around throughout the entire night. 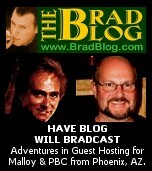 Got to hang throughout with several BRAD BLOG commenters as well, including RAM, Mike Shelby and others. A great time was had by all (I think) and a bunch of radio fun ensued. Brad on "The Noose Tightening", Rep. Maurice Hinchey (D-NY) on the Fairness Doctrine, AMERICAblog's John Aravosis on Wingnut Propoganda after the recent DC War Protests. AfterDowningStreet.org's David Swanson on House Judiciary "Signing Statement" hearings, VotersUnite.org's John Gideon on the latest Daily Voting News and VoteVet.org's Peter Grenato on the Bush Iraq escalation. BRAD BLOG's Libby Trial correspondent Margie Burns and John Bonifaz on Florida's 13th Congressional District election contest. The aborted townhall explained and AZ's Democratic Party Election Integrity Commission Chair Dr. Ted Downing. Intro with KPHX's Jeff Farias, AuditAZ.org's John Brakey on Election Integrity in AZ, AZClean.org's Eric Ehst on Clean Elections and AZAdvocacy.org's Linda Brown on Voter ID. More phone calls plus VotersUnite.org's John Gideon and still more calls and wingnut stomping. « PREVIOUS STORY "Frank Rich Has It Right - The Libby Trial Is VERY BAD for Cheney and This White House"
"AUDIO - Brad's Guest Hosting Radio Mayhem"
Hooray! Thanks for the links, Brad! Lol, Brad. I just heard you mention me at 29:30 in the 2nd hour of TMM show. Yes, I did leave. My feet got cold after I stepped in that puddle (just sandals)in the 'smoking section' outside. Here in Phoenix, we usually bring a sweater if we're going to be out in the night cold. Since I hadn't planned on TMM show, I didn't bring warm clothes. And, I was hungry. I listened to some of the show on my car radio --- until I drove too far and couldn't get it anymore. I've been checking out the AZ websites from your blog while listening to the guests. Great info --- thanks! Before Katrina hit New Orleans and before anyone knew it would, when it was a 4 way out in the gulf, we had a thread here. I pointed out that a conservative ex-congressman, a republican civilian, was the titular head of the Army Corp of Engineers. He had been asking for several years for money to repair the levees indicating that a hurricane could breach them and destroy New Orlears. The oil barons in the white house shot him down on his request for 50 or so million dollars, and only allowed him about 5 million in the budget share. Then Katrina hit as was expected and talked about on this blog. Now, there is a Libby type lawsuit where the Army Corp of Engineers is being sued in federal court for not doing their duty (Link Here). The potential facts coming from this case can be just as devastating to the neoCon madmen in the white house. The Libby case along with this case will show that they lied to get us into a perverted war and spent billions on their war profiteering illicit partners, while at the same time fighting against making an American city safe from real impending danger. For those who would like to follow the Katrina lawsuits (post #3 above), the federal district court in New Orleans has started a website for that purpose. I like the choice for the song to open the Malloy show. Just like a substitute teacher, the trolls were able to get away with a bit more, but when Mike comes back, there won't be any more of that learning time wasted on the punks. It is fun to listen to them try to defend themselves when they're out of their Hannitized element though. Larry B. - Oh Man, You stole my thunder I was thinking the same thing. The WHO song "Substitute" was a great bumper !!! Brad blows away most of the hacks on radio, He's quick & witty and should have his own show. Especially if ya want to hear facts & the truth. Ram - So true you are. Amazing how relevant that song is today . . . . . Perhaps that why they call it "Classic Rock"
Pete Townshend stated that Substitute simply "was about nothing"
Hummmmm That To . . .
JoJ: I'm still not sure --- is Brad going to do our laundry, too? Cleaning up the Exxon oil spill down at the Swishy Washy coin-op! That last line was for 99. Ralph Nader on Why He Might Run In 2008, the Iraq War & the New Documentary "An Unreasonable Man"
Consumer advocate and former presidential candidate Ralph Nader says he will decide later this year whether to run for president in 2008. Today he also looks back at his childhood and his new book "Seventeen Traditions." In addition, film director Henriette Mantel joins us to talk about "An Unreasonable Man." RALPH NADER: Too early to say. I think we need more voices and choices. I think the speech by former Senator Mike Gravel indicates there’s going to be a wider debate in the primaries of the Democratic Party, along with Congressman Dennis Kucinich. There are lots of people in this country urging Bill Moyers to run in the Democratic primary. He would certainly give it more depth. And I hope more independent candidates and third-party candidates run. We’ve got to break this two-party elected dictatorship that’s being measured by how much money it raises.